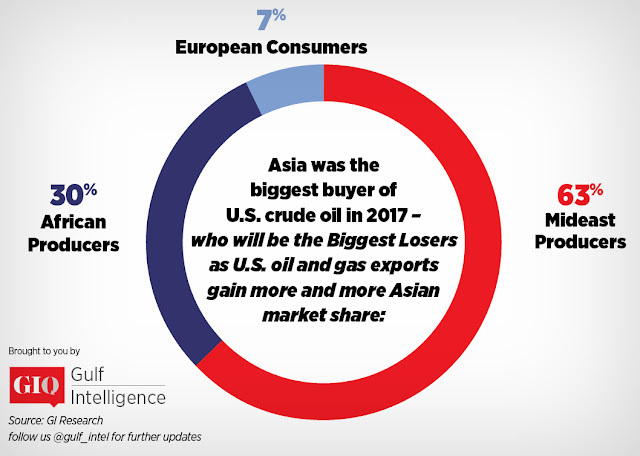 Dubai, UAE (Feb. 18, 2018) – Middle East oil and gas producers are likely to be the biggest losers from U.S. energy exporters gaining more and more market share in Asia, according to 63% of industry executives polled in a Gulf Intelligence Survey. Meanwhile, almost a third of the survey respondents, a cross-section of energy stakeholders in the UAE and the UK polled ahead of the 2nd Gulf Intelligence Middle East Energy Summit at International Petroleum (IP) Week in London this week, said that African producers would be the most impacted from the fast-growing U.S. customer base in China, India and across Asia. In the period 2011-2016, global oil demand increased 8.6% with the exception of Europe. This led to a shift of focus by Middle East suppliers from Europe to Asia, with exports to the east increasing from 2.8 million (m) barrels a day (b/d) to 3.7m b/d. In parallel, the advent of the U.S. shale ‘revolution’ has placed that country’s oil output today at above 10 m b/d, matching Saudi Arabia and seen potentially hitting 11 m b/d this year in line with Russia. U.S. exports are expected to be 1.5 m – 2 m b/d in 2018 with some projections seeing them hit 4 m b/d as soon as 2022. This new dynamic has brought the U.S. new customers in both Europe and Asia, with most exports landing in China, now the second largest buyer of U.S. crude after Canada. Meanwhile, U.S. foreign oil imports have dropped 3 m b/d since 2014 with net imports now at 4 m b/d compared to 12 m b/d in 2005. U.S. oil and gas has also landed on Arabian Gulf shores in the past year, with the UAE and Kuwait both taking cargoes. 68% of the GIQ survey respondents expect this trend to continue. On the future direction of oil prices, 80% of survey respondents were of the view that Brent crude would average in the $60s/bbl range in the first half of 2018. 10% were more optimistic, placing the average in the $70s while 10% saw it dropping back to the $50/bbl range. The OPEC/non-OPEC agreement to slash total production by 1.8 m b/d during 2017 and extended through 2018, has so far propelled a recovery in Brent oil prices from their lows in 2015 and early 2016 when they dipped under $30/bbl. Prices broke through the $70/bbl mark last October on the back of a very successful level of compliance throughout the year by oil producers to the output cut deal, as well as continued growth in global oil demand. In the last few weeks, prices have settled back into the $60s. OECD oil stock inventories are still 100 million barrels plus above the 5-year average and producers who have signed onto the output cut deal have set the removal of this excess as a main target to achieving oil demand and supply balance in the year ahead. The Gulf Intelligence survey audience was split 50/50 on whether geopolitics or oil supply cuts would have the greater influence on oil prices in the coming year. This compares to a similar GIQ survey conducted in mid-January where two-thirds of respondents felt the former would play the weightier role. The 2nd Gulf Intelligence Middle East Energy Summit, in partnership with the Fujairah Oil Industry Zone (FOIZ), is part of IP Week hosted by the Energy Institute, and will gather members of the energy community from the region and beyond to exchange knowledge and intelligence on the most pressing issues facing the industry.